This website does not necessarily address or reflect the views or opinions of the National Longhouse. It was created solely for the purpose of promoting the Chagrin Valley Nation: Native Dads and Sons and Native Dads and Daughters programs. Although we strive to verify the contents of this site, accuracy of the submissions cannot be guaranteed since in some instances, information is received by secondary sources. Any personal information collected by us will be used only in connection with the Native Sons and Daughters and will not be sold or used in any other way. We also do not knowingly collect personal information from children. Any Indian Tribes named or referred to on this site are not affiliated with actual Native American Indian Tribes or Nations. 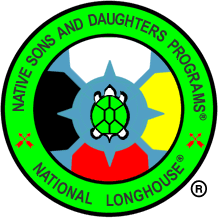 The National Longhouse Native Sons and Daughters program is a non-profit organization whose purpose is to strengthen parent-child relationships. Unless otherwise noted, all content ©Copyright 2014 Chagrin Valley Nation Native Sons and Daughters program. All Rights Reserved.